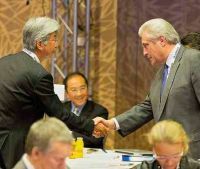 The fact that it is not the easiest of places to get to did not put off some 600 delegates who attended last week’s International Air Transport Association (IATA) 69th Annual General Meeting at Cape Town. 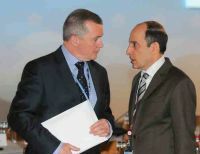 The focus was on Africa as Tony Tyler, since 2010 Director General and CEO, said in his opening address. He saved his most forthright comments for later on with what was seen as an attack on Heathrow. When boss of Cathay Pacific he was more diplomatic. “It drives me mad with frustration”, he said and accused management of not taking tough decisions to cut costs and abusing its monopoly. “Nowhere is the potential for aviation greater than on the African continent – the home to a billion people spread across 20% of the world’s land mass. Economic reforms and political stability have spurred growth and development. South Africa is the newest member of the BRICS grouping of states (Brazil, Russia, India, China and South Africa). And the 50th anniversary of the African Union reminds us of its vision for an integrated, prosperous and peaceful Africa, driven by its own citizens and representing a dynamic force in the global arena. Aviation is well placed to contribute to these and the other long-term goals so vital to the development of Africa”, he said. Safety is the biggest challenge facing African aviation. 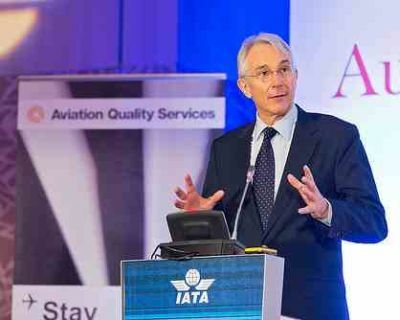 “IATA’s 20 sub-Saharan members are performing in line with the global average on safety as are the 24 sub-Saharan airlines that have met the 900+ standards of the IATA Operational Safety Audit (IOSA). But if we look at the entire African industry, safety remains a challenge with an overall accident rate many times the global average. This AGM is an opportunity to send a clear signal to the region’s governments that world class safety is possible in Africa and that we support their commitment to achieving it by 2015”, Tyler noted. Fuel costs are 21% more expensive in Africa than the global average (see Virgin Atlantic withdraws from Accra). Government policies towards aviation in Africa tend to see it as an “elite” product, rather than as a critical component of the continent’s economic infrastructure. As a result, it is heavily taxed – often in violation of International Civil Aviation Organisation principles that prohibit the taxation of jet fuel for international operations. Tyler pointed out that Africa also suffers the impact of onerous direct taxes on tickets. Solidarity taxes, tourism taxes, VAT, sales taxes and infrastructure levies and taxes all make connectivity more expensive. “This limits the power of aviation to drive economic growth, which would be a much greater source of revenue for governments”. London’s Heathrow has been branded one of the biggest airport problems by senior industry figures. In a change from attacking government policy on Heathrow, Tyler lambasted the airport directly, warning that it risked turning its dealings with airlines into a constant struggle over cost, service levels and capacity. The airport defends itself with its development of the new Terminal 2 ((as reported elsewhere in this issue)) and scheduled to open next year. Heathrow has been pushing for a 40% real-terms increase in landing charges that airlines regard as excessively high, raising the prospect of higher fares. However, in April the CAA, the regulator that caps airport charges, said it would ensure further rises were kept below inflation until 2019. Fees have surged to an average of £20.78 per passenger over the past five years, amid sustained investment in Heathrow. Tyler said the proposed cap was “weak medicine for a major illness”. He also criticised Heathrow’s response as disappointing and “not what you would expect of an important business partner”. Other aviation bosses echoed Tyler’s remarks. Alan Joyce, Chief Executive of Qantas and outgoing Chairman of IATA, said: “When you look at what the airline industry has gone through – cutting costs – we don’t see that drive in the airports to use new technology and change practices in the way airlines have done”. Airports will retort that they were not designed for the 21st century security phenomena, the result of 9/11. Typically the rebuilt Heathrow T4 facility can only be described as massive. Space has to be found both outbound and inbound. Cape Town, very hospitable, was nevertheless an awkward spot to get too. The 70th event will be in Doha, somewhat more accessible and completely different. But will there be flights from Brandenburg to Hamed International?